What is the reason dor recon? My thought is it's for safety issues, but that would mean the state only cares for oahu's safety and not care about the other islands. Must be So we can pay for states debt! we can't do whatever we want to our own property is messed up! We are part of the USA so we should have the same law as all the other states which don't even require a safety check only smog check. Just too many people on Oahu, so certain laws are put to use. its an excuse to pull you over and give you tickets! 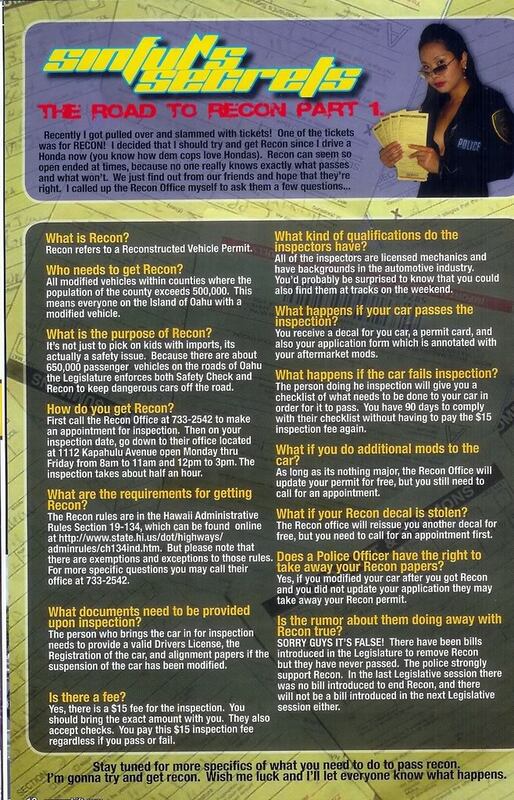 actually, looks like the cops are becoming more lenient again, but i still drive an almost stock car as my daily... tired of adding to my pile of recon tickets. What ever happen to the work done to do away with it..just found out I have a recon stopper on my truck..